WildLife Energy Drink was developed by sportsmen for sportsmen and is dedicated to the American outdoor sportsman in every way, from its distinctive outdoor-themed packaging to its support of wildlife conservation projects and outdoor programs. WildLife Energy Drink is an enjoyable and effective energy drink for outdoorsmen. And, by purchasing WildLife Energy Drink, consumers are also helping to support Wild Life Conservation projects. WildLife Energy Drink annually will donate a portion of its proceeds to outdoor conservation programs. 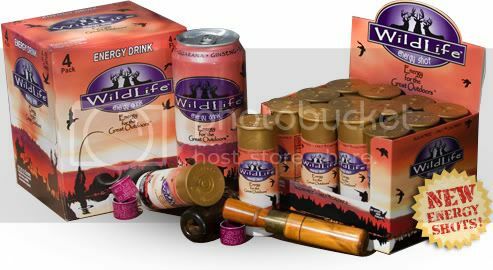 WildLife Energy Drink is sold in cases of 16-oz. cans that display one of three outdoor sports scenes: fishing, hunting or bow hunting. Made with ginseng, taurine, guarana, Vitamin C and other nutrients and vitamins, WildLife Energy Drink is superior to any other energy drink on the market when it comes to taste and performance-enhancing properties. WildLife Energy Drink is an intelligent functional drink carefully formulated for times where extended endurance is needed. From early-morning hunting adventures to late-night fishing expeditions, WildLife Energy Drink can increase your vigilance and wakefulness, improve concentration and reaction speed.